Suboxone is a Brand name for a medication that contains combination of buprenorphine and naloxone as active ingredients. Suboxone is used for the treatment of narcotic (opiate) addiction. It is not as a pain reliever medicine. Buprenorphine is a partial opioid agonist, which relieves symptoms of opiate withdrawal, while naloxone belongs to the class of drugs called opioid antagonists, which reverse the effects of narcotics. Suboxone is used as part of a treatment program that usually includes lifestyle changes, counseling and other interventions. It is available in sublingual tablet form in buprenorphine dose of 8 mg and naloxone dose of 2 mg.
Buprenorphine exhibit analgesic effects due to its partial agonist activity on mu-opioid receptors in the brain. Buprenorphine is also antagonist of kappa-opioid receptor. The partial agonist activity means that the antagonist of opioid receptors (such as naloxone) only partially reverses the buprenorphine’s effects. Binding to the mu and kappa receptors result in hyperpolarization of neural membrane and reduces excitability of neurons. Buprenorphine slowly dissociates from its receptor and has longer effects compared to morphine. It has a very low level of causing physical dependence. Buprenorphine’s receptor half-life is about 40 minutes which is much longer than morphine which half-life is counted in milliseconds. Naloxone is an opioid antagonist drug that prevents or reverses the effects of opioids drugs such as respiratory depression, hypotension, pupillary constriction and sedation. Also, it can reverse dysphoric and psychotomimetic effects of agonist-antagonists drugs such as pentazocine. It is essentially pure narcotic antagonist that does not have “agonistic” or morphine-like characteristics. While the mechanism of naloxone action is not yet fully understood, the some evidences suggest that naloxone antagonizes opioid effects by competing for the same receptor sites, especially the opioid mu receptor. Recent findings show that naloxone binds to all three opioid receptors (mu, kappa and gamma) but the strongest binding is to the mu receptor. Buprenorphine is metabolized in the liver and eliminated by urine and feces. Naloxone undergoes metabolism in the liver as well. Metabolic reactions in the liver create Suboxone’s metabolites that can stay in the body for even longer than the drug itself. Modern drug tests can detect such metabolites as well even after 8 days. 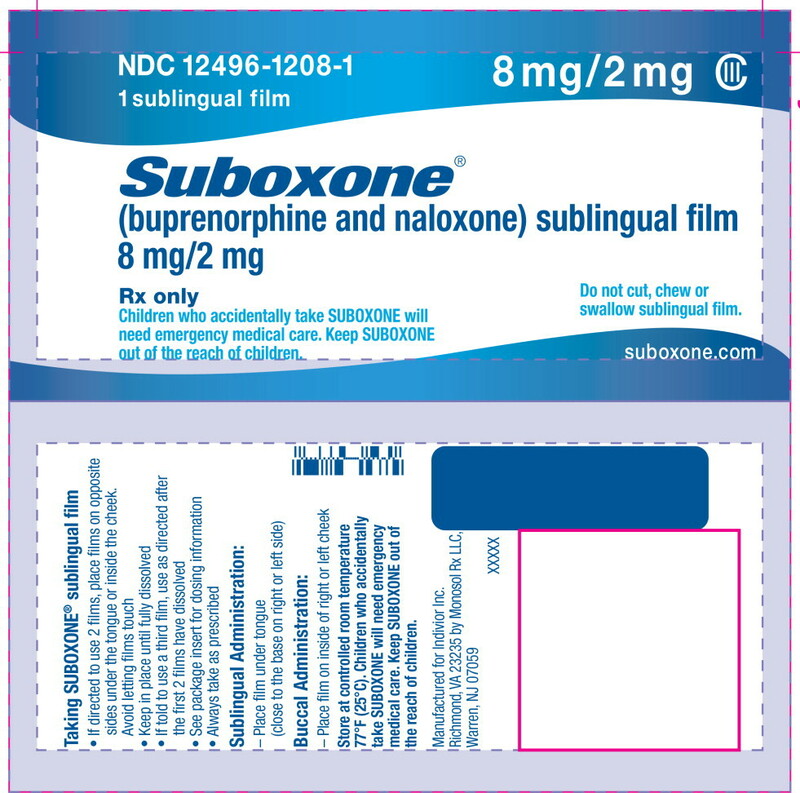 After Suboxone sublingual administration, buprenorphine has an elimination half-life time ranging from 24 to 42 hours and naloxone has an elimination half-life time ranging from 2 to 12 hours. Buprenorphine becomes detectable in the urine just 40 minutes after consumption, and if it is used for a long-term, drug may show up in lab tests for up to 2 weeks later. The drug and its metabolites can also build up in follicles of the hair and can be detected for 1-3 months; however this is so reliable drug testing form. Tablet should be placed under the tongue and dissolved. Several minutes will be needed for full dissolving. Patients should follow the directions on the prescription label. Medicine should be leaved in the sealed foil pack until patients is ready to use it. If dose requires to take at once more than 2 tablets, either place all the tablets at once under the tongue, or if you cannot fit more than 2 tablets comfortably, place 2 tablets at a time under the tongue. Either way, you should hold the tablets under the tongue until they completely dissolve. Do not swallow or chew this medicine. This medicine has to be taken at regular intervals. Patients should not take this medicine more often than directed. What happens if I miss a Suboxone dose? Take the missed dose of Suboxone as soon as you remember. Skip the missed dose if it is almost time for your next scheduled dose. Do not take extra medicine to make up the missed dose. What happens if I overdose Suboxone? Patients have to seek emergency medical attention immediately or call the Poison Help line at 1-800-222-1222 if they overdose Suboxone. A Suboxone overdose can be fatal, especially in a child or other person using the medicine without a prescription. Overdose symptoms include severe drowsiness, blurred vision, slurred speech, thinking problems, loss of coordination, and weak or shallow breathing and weakness or limp feeling. Patients should never take Suboxone together with alcohol. If buprenorphine is used together with central nervous system depressants such as alcohol, there will be increased risk of buprenorphine overdose and causing serious side effects such as severe respiratory depression, coma, and death. The most common reported cases have primarily occurred in the setting of buprenorphine maintenance therapy for the patients with opiate addiction, and many involved abuse or misuse of buprenorphine including intravenous self-injection. The exact mechanism of interaction between alcohol and buprenorphine is still unknown, but some preclinical studies suggest that CNS depressives can alter ceiling effect on buprenorphine-induced respiratory depression and render the buprenorphine’s respiratory effects similar to those of full opioid agonists such as morphine. Animal studies data have failed to find the evidence of Suboxone teratogenicity; however, it is known that use of buprenorphine has been related with fetotoxicity and difficult parturition, including implantation losses and decreased postnatal survival in animals. However, there are no controlled data in human pregnancy. FDA pregnancy category is C which means that: Animal reproduction studies have been shown side effects on the fetus and there are no acceptable and well-controlled studies in humans, but potential benefits may warrant use of the drug in pregnant women despite potential risks.